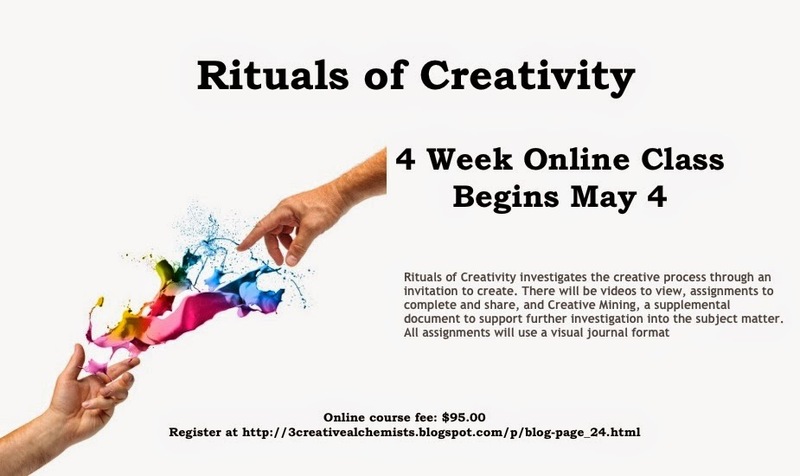 What students have said about 'Rituals of Creativity™"
Patricia wrote: "I shared this yesterday, but I wanted to share again and explain why. In our lives, one of the things that we often are not always aware of are rituals. Some rituals are really just automatic actions....I get up in the morning, I brush my teeth. If I do it regularly in that way, it is a ritual. However, there is a whole energetic, and dare I say magical, thing that happens when we engage in a Conscious Ritual. For me, creative work...whether is is artistic expression or problem solving... is dramatically enhanced when I approach it through a ritual. This workshop is relevant to all types of creative work. I took the on-line class and am so excited to attend the class in person. My plan is to anchor and expand the work I have already done. Roberta Veatch and Vickie Vicki Gaia are both well established as artists. This is a remarkable opportunity to learn some tools... AND PLAY WITH some of the BEST! Some fun habits to unlock your creativity from Huffington Post. We teach many of these habits in our classes, especially to still the inner critic and just have fun. There are plenty of ways to jump start your creative juices. First, though, we must not be afraid, and we need to walk through the fire to the other side, and face our fears. One way is to create habits that sustain our inner creativity. I love the suggestions in this article. Read an interesting article by Clive Thompson in Wired magazine. In a nutshell, I'm going to paraphrase it here. If you're "dying of boredom" don't head for your phone, tablet or one of the myriad of mobile devices to play a game of Solitaire or Angry Birds! Boredom fuels your creative mind. We need to lean into these downtimes so we can delve into deeper thoughts. This might be the reason why I think of my best ideas in the shower. Nothing to do but soap and wash.
A restless mind craves stimulation. When you're not satisfied you tend to seek out ways to engage your mind. What worries psychologists is we are eliminating these 'slow times' by grabbing our mobile device. This shuts down deeper thinking. I love this: Call boredom useful and productive monotony. But be aware there is a difference between useful boredom and lethargic boredom. Lethargic boredom is when you can't be bothered. When you feel worn out like a faded dishrag. So embrace "fructifying boredom" and shut off those pesky devices at least for while.